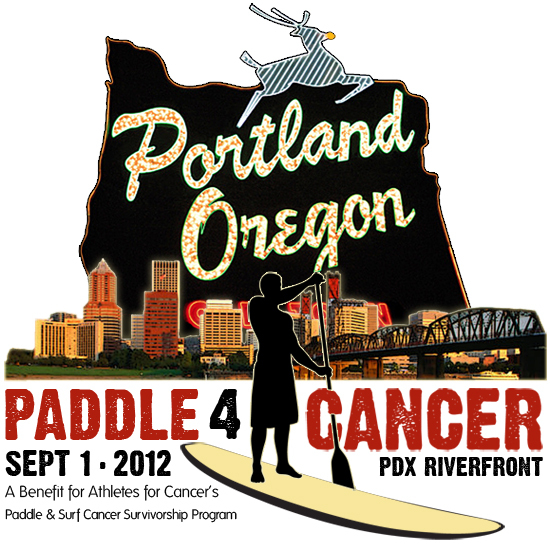 PADDLE 4 CANCER Portland Sept 1! Home Latest Articles Race PADDLE 4 CANCER Portland Sept 1! Presented by Subaru! Register for a full day of fun including standup paddle races and events that all raise money for Athletes for Cancer’s Koru Survivorship Program. There is food, beer from Full Sail Brewing, a Kids’ SUP Art Tent, SUP demos & rentals, and RAFFLES galore. WIN a Bark Custom SUP Board & Quickblade Paddle Package! The Big BARK Raffle! We’re selling just 150 raffle tickets at $50 each for the chance to win this coveted prize package valued at $3750. We have two other raffles for a chance to win even more cool stuff! Fundraise over the next two weeks and you could win a Carbon Paddle by Kialoa, a Waterproof HD Video Camera by Oregon Scientific and best of all… the top fundraiser wins a Starboard Astro Inflatable 12’6″ SUP & Paddle Package, courtesty of Starboard SUP. It costs $1700 to send one survivor to camp and change their life. Shoot for that. It’s easy and has major impact. ALL levels of standup paddlers, kayaks and OC 1s are welcome to race! Or, take the FREE beginner SUP clinic then do a short 1 mile race. Kids’ Race: For $5, kids ages 6-13 can get on a SUP board and paddle in the Kids’ Race. With lots of assistance and cheers from the water, this is a great event to introduce your kids to the water. Kids’ SUP Art Tent: A tradition at our events and our survivorship camps. Here we lay out the tools and supplies with a big SUP board and let the kids go to town! Children under 13 must be supervised by an adult. Register before August 30th for 2 or more events and get a Dakine Limited Edition Athletes for Cancer Backpack, event jersey, lunch, and raffle tickets for the Athletes’ Choice Raffle. That’s a lot of good stuff that does good. Interested in volunteering? Please fill out our event volunteer form here. Want to learn more about Athletes for Cancer’s programs? Please check out our website, athletes4cancer.org, and please view some of our videos. They tell the story like nothing else. Thank you for your support! Subaru, Kialoa, Suplove, Dakine, BARK Boards, Full Sail Brewing, Starboard, Quickblade, Kaenon, Oregon Screen Impressions, Riviera Paddlesurf, 2XU Compression, 2nd Wind Sports and The Clymb. Previous articlePADDLE4PEOPLE: HATS OFF TO MORGAN BLITTNER & JUAN PAVAN/TKS MIAMI, JIMMY LEWIS and A LOCAL MOVEMENT!! Next articleWerner Paddles Introduces The “Stinger” For River Runners!